Ever since they were introduced in the 1980s Teenage Mutant Ninja Turtles animated series, Bebop and Rocksteady have been two of the most popular, though certainly not smartest, adversaries for the reptillian martial artists. After being substituted with Tokka and Rahzar in 1991’s Teenage Mutant Ninja Turtles II: The Secret of the Ooze, these two thugs are finally getting their cinematic due this summer in Teenage Mutant Ninja Turtles: Out of the Shadows, and now we have our best look yet at their mutated appearances. 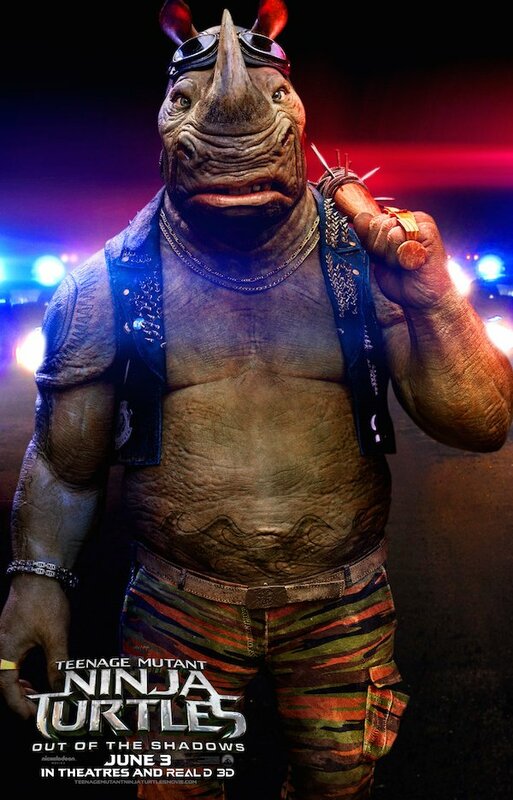 Although Bebop and Rocksteady were seen both in human and mutant form in Teenage Mutant Ninja Turtles: Out of the Shadows’ first trailer, these posters provide up-close details that you just can’t get watching them charge at the Turtles. First up is Bebop, played by Gary Anthony Williams. As far as humanoid warthogs go, he’s looking good. The fur is well-groomed, the tusks look sharp, and he appears ready to get in a brawl. He’s also still rocking the purple mohawk and sunglasses even in his new form, and we wouldn’t have it any other way. Next, Rocksteady, played by WWE star Sheamus. Unlike Bebop, his red hair is gone, but honestly, what does a giant rhino man need hair for anyway? With that face, it’s not like his red beard would have helped him get a date. As if the horn and tough skin weren’t bad enough, Rocksteady also has the baseball bat covered with nails, which I imagine was his weapon of choice when he was still human. 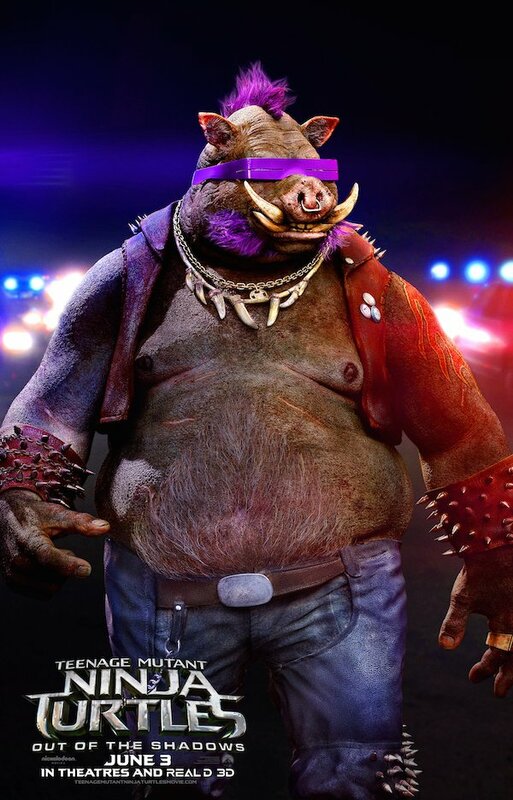 Just like in other stories, Bebop and Rocksteady will already be wanted criminals when Teenage Mutant Ninja Turtles: Out of the Shadows begins, but they’ll soon be forcibly recruited by Shredder to be his "errands boys" and transformed into their animal selves by Baxter Stockman. As mentioned earlier, these two aren’t intelligent, but as pure muscle, they’ll give the Turtles a lot of trouble once they’re pointed in the right direction. Along with these posters, Paramount also released a new extended TV spot for Teenage Mutant Ninja Turtles: Out of the Shadows, which features a mix of footage from the first trailer and the Super Bowl TV spot, along with a few new reaction shots. Since Shredder and Krang are the main masterminds of the movie, don’t expect Bebop and Rocksteady to do any scheming on their own in Teenage Mutant Ninja Turtles: Out of the Shadows. They’ll just do what their told, whether that's fighting the Turtles up close or shooting at them in a tank (I still can’t believe we’re getting that). That said, their incompetence and dimwittedness will almost certainly get a lot of laughs, so they’ll still have something important to offer. Teenage Mutant Ninja Turtles: Out of the Shadows hits theaters on June 3.